Third behind his Willie Mullins-trained stablemate Lagostovegas in the Ascot Stakes on his second start after a long absence, Stratum justified strong market support in the inaugural running of this extended two-mile handicap. Robert Winston weaved his way through the field on the 11-4 favourite to lead at the business end and win cosily, continuing the fine run of his owner, Brighton chairman Tony Bloom, who was successful with Withhold in the Northumberland Plate. Kloud Gate was beaten three lengths in second place, with Coeur De Lion a neck away in third and Golden Wolf another head back in fourth. Winston, who also rode the Roger Charlton-trained Withhold, said: “Everything went to plan and he settled well today. “He had a hood on and had a grackle bit on. He had a much faster pace today and got into a lovely rhythm. It was just a matter of when I was going to get a gap in the straight. “He came there with plenty in hand and quickened nicely in front. 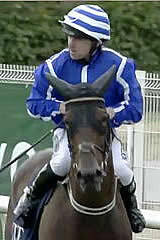 “He was far too keen (at Ascot) and it was a very muddling pace. This is just stepping stones at the moment. I think the possibility would be the Ebor next for him. The JLT Cup was introduced in response to industry demand for an enhanced programme for stayers, supported by the Newbury board of directors, and is also welcomed by bookmakers. The £100,000 prize fund includes a £30,000 contribution from the British Horseracing Authority’s Development Fund.